Rebecca Innis has one piece of advice for new students: get involved. It’s anything but a pat reply from this recent graduate of the Bachelor of Physical Education and Coaching (BPEC) program - and the latest recipient of the Douglas College Student Excellence Award. Besides maintaining top marks while at Douglas, Rebecca found the time to volunteer – and then some. 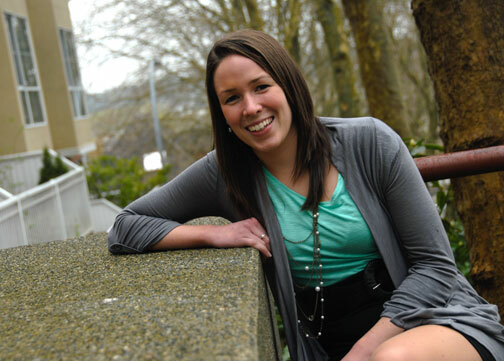 She ran modules at a leadership retreat with the Centre for Campus Life and Athletics, organized Sun Run clinics for students and coached cross-country and wrestling teams at secondary schools around the Lower Mainland, where she also observed, assisted and taught in math, science and physical education classes. If that weren’t enough, the Coquitlam native also represented Douglas at the 2010 National Student Leadership Conference in Bancroft, Ont., founded the Douglas Outdoors Club and coordinated the College’s Student Research Day in 2010. Rebecca did all this while working as a lifeguard and swimming teacher, going as far as to create a new program called Swim to Survive, which taught Grade 3 students what to do if they fell into deep water, as well as lessons in ice safety, boating safety and more. A high academic achiever, Rebecca was a peer tutor for Sport Science students struggling with courses such as biomechanics, biology and exercise physiology. One of her class projects, which outlined a comprehensive annual plan for athlete development, is being used by Wrestling BC, a provincial sport organization. She’s done her share of research, too. While at Douglas, Rebecca carried out research developed by Ken Anderson, Coordinator of the BPEC program, as well as expanding on research on core power fitness testing that she and classmate Rozlyn Jacques had begun in Ken's research analysis class. Her instructors describe her as a hard-working, dedicated, well-rounded individual who pushes the limits to make a difference. In turn, Rebecca loved her instructors for their hands-on approach, helpfulness and support. Fresh from a well-deserved six-week vacation in Australia, Rebecca has set her sights on getting into Simon Fraser University’s Professional Development Program for September. Once she graduates, she wants to teach experiential studies-style courses in outdoor education, which combine academic learning with field studies. She eventually hopes to teach at the college level – where she’ll undoubtedly encourage her students to get involved.